Tonight the movie was Breach, and oh, was it ever good. As I said last week, I love spy movies. This is based on a true story of an American agent who turned against the US. 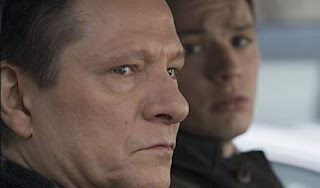 It stars the great Chris Cooper as the aging spy. We see him in all his complexity; a devout Roman Catholic who adores his grandchildren, yet feels overlooked by the agency and sells secrets to the Russians. Ryan Phillippe plays the young "clerk" who looks forward to becoming an agent someday. Laura Linney is the person who leads the investigation of Cooper. A nice treat was seeing the star of the short-lived, but much-loved Wonderfalls, Caroline Dhavernas as the wife of Phillippe. The movie comes out next month on dvd. Combine 1 cup flour and powdered sugar. Cut in butter until crumbly. Press into greased 9x13-inch pan. Bake at 350º F for 15 minutes or until light brown around edges. Beat eggs and stir in 1 cup sugar, 1/4 cup flour, and salt. Add vanilla and rhubarb. Put over bottom crust. Bake for 30 to 35 minutes. I got this recipe years ago online, and made it for the first time today. It is delicious! Plenty sweet to balance the rhubarb tartness. These grow all around my daughter's rental house in the woods. We don't have any on our land. They are called Red or Purple Trillium, and also Wakerobin and Birthroot. I read that picking the flowers of Trillium can seriously injure the plant. The three leaves below the flower are the plant's only food source and a picked trillium may die or take many years to recover. My husband and I read Delta Wedding by Eudora Welty ages ago, and we think it contains the funniest line she ever wrote. A fourteen (!!) year old boy is driving the family Studebaker when one of the other boys calls out, "Let Bluet drive!" The baby is handed into the front seat and stands up between this young driver's legs, and presumably puts her hands on the wheel. Couldn't do this now, but the year was 1923. Slow cars, no seat belts, anyone could drive. The boy, Orrin is described as a "wonderful driver." I expect this won't strike any of you as particularly funny, but we break out in gales of laughter each time one of us says it. Plus, I just love the name, Bluet. One of the many names of the Centaurea montana is Mountain Bluet. It is also called Perennial Cornflower and Perennial Bachelor's Button. The little May Flowers which pop up in the fields, were called Bluets by my mother. Syringa vulgaris is the state flower of New Hampshire, because it "is symbolic of that hardy character of the men and women of the Granite State" (New Hampshire Revised Statute Annotated (RSA) 3:5). In my little part of the world, you may count on lilacs on Memorial Day, or as it is now known, Memorial Day Weekend. Whether the winter is long or short, whether the spring is wet or dry, cool or warm, the lilacs are in bloom. It is a miracle of life to me. When we first moved here 26 years ago, there was only one lilac bush. We brought with us my mother's dark purple lilacs and our neighbor's light purple ones. We've bought some plants over the years and divided others until we have lilacs all over the place. The one original has since become a part of the south pasture, and we must put mesh fencing all around the bottom so the animals don't eat it. Lilacs seem to be a delicacy, particularly to goats. South of Washington, Richmond, Birmingham, and Memphis, lilacs are chancy indeed, but north of those cities, all the way to the North Pole, I suppose, they are a joy of full-blown spring. They make up, a little, for the lack of crape myrtles and oleanders in arctic-type places. Faith is a strange and wondrous thing. All winter we see the lilacs leaning against the blizzards, grey, lifeless. Nothing could look more dead than a lilac bush in January. It is only a bunch of sticks. The only thing alive about it is the chickadee swinging on a doughnut hung on a branch. Quite casually the miracle begins. There is never a moment when we can say, now the buds have begun to swell. As love ripens in a good marriage, the lilacs turn the tight glassy buds into small spikes,and then into visible purple. And then in May, a flowering time comes. The air is filled with deep, rich fragrance - and who can describe the odor of lilacs? It is a romantic scent, heavier than roses, but never cloying. Lilacs, I think, are the theme song of New England, even more than apple blossoms or the ramblers which will follow. Yet they are not peculiar to New England, for I remember in northern Wisconsin in Door County, we used to drive out to gather great bouquets of them growing around deserted cabins. Or where a house once stood, around the blackened chimney, the lilacs gave a sweet immortality to the home that had gone. This recipe comes from Mrs. Chard's Almanac Cookbook Hollyhocks & Radishes. In just a couple blinks of an eye, you'll have a really good dessert... rather like a nice, crunchy, butterscotch brownie. It works with apples, too. Serve warm, topped with whipped cream or ice cream. Place diced rhubarb in a medium-sized bowl. Sift flour and baking powder over top. Add sugar, nuts, vanilla, egg. Mix altogether and spread in a buttered, 9-inch pie plate. Bake 25-30 minutes. My notes: I just mixed everything together. My 9-inch pie plate said 1 quart on the bottom. The only reason I mention it is that my other 9-inch said .75 quart. I decided I'd go with the bigger one and it worked well. I used vegetable spray for the pan, and dotted the dessert with butter. This was excellent, and I didn't even have whipped cream or ice cream. I plan to make it again this rhubarb season. 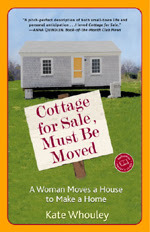 Recently, and most coincidentally, I've read two books about single women renovating cottages in Massachusetts. The first was Cottage for Sale, Must Be Moved by Kate Whouley; the second, Still Life with Chickens by Catherine Goldhammer. They are, perhaps surprisingly, quite different books. The first one is written by a single woman who lives in a very small cottage on Cape Cod. She decides to buy and move an old tourist cottage to her land and attach it to her house, a very interesting and less expensive way of enlarging her living space. Her book is rich with all the people who help her along the way. She has a map of her land in the front, and as in great old mysteries, a cast of characters. They are listed under three categories: Movers and Makers, Planners and Town Officials, Friends and Neighbors. Tom McKean, Tuba player and head of the Health Department. Harry, Musician, computer programmer, woodworker, carpenter - and one of the Bog Boys. I am a compulsive reader of the classifieds. For this reason, I do not get the daily paper. But each week, the Pennysaver arrives in my mailbox, and I cannot resist the urge to read: Wedding Gown: Priscilla of Boston, Ivory Lace. Size 8, Never Worn; Paid $2500. Sacrifice $1200. Imagine selling your unused wedding gown. Soon-to-be wed women calling you, the disappointed bride-not-to-be. Cottages for Sale. $3000 each. Must be moved. I imagine these cottages, all in a row. If the reader has had any long-term work done on her house, the situations will be all too familiar. The waiting, the excitement, the getting to know the men who are in your house - in your life, day in and day out for many weeks or months. And when they leave, when the job is all finished, there is delight, and also, a bit of sadness for the loss of that constant company. I liked this woman, I liked her friends and the working men, and most importantly, I liked the way she cares for all of them. She's just the friend you'd like to have; thoughtful, generous, grateful, just plain nice. I also like the house and its place on the land. She describes it before the coming of the cottage. I live on Cape Cod in a three-room house that was built in 1950. It is a quintessential seacoast home: weathering cedar shakes, yellow shutters, summertime window boxes filled with lavender impatiens, a white picket fence out front. To reach the house, you travel a long dirt driveway and climb six brick steps, walk through the arbor and along the slate path that separates the shade and sun section of my perennial garden. Knock on the front door - there is no doorbell - or come around and rap on the glass panes of the kitchen door. I am more likely to hear you there. This makes me want to do just that. The house sits on a flat bit of land in a hilly landscape; the downslope from the south-facing patio leads to an ancient way, now a gravel drive for my neighbors to the rear. From the kitchen you can see past the drive to an overgrown cranberry bog, home to cardinals and catbirds, doves and quail, robins, purple finches, crows, jays, red-winged blackbirds, the itinerant warbler. Turtles occasionally climb up the hill from the wetland; I find them nosing around the myrtle or behind the house under the holly tree. Along with the map, there are photographs, though not nearly enough for me. I wanted to see everything, and in color. These are nice black and whites, but I wanted to see the colors and more interiors. But I was happy to find more at her website. As I looked back over the book to write this little "report," I realized that I already want to read it again. I simply loved it. The second book, while looking a bit the same from the outside, is quite different. This woman is single through becoming recently divorced. While Kate Whouley has a cat, Catherine Goldhammer has a twelve-year-old daughter and a dog. She is moving because she can no longer afford the lifestyle in the upscale, median income in the six figures, neighborhood which is the only life her daughter has ever known. A columnist once described this town as a place where "the lawns are green and the hearts are cold." I did not have a year in Provence or a villa under the Tuscan sun. I did not have a farm in Africa. Instead my diminished resources dictated a move to a run-down cottage in a honky-tonk town where live bait is sold from vending machines. But as luck would have it, in a town where houses rub elbows, I came to live at the edge of a pond beside a small forest. I came to a place where a thousand dragonflies the size of small birds fly over my yard in the summer. In a town where everyone knows everything, I came to live in a place no one knows exists. This isn't a rich suburb, though it is only five minutes from their old house. It is a town "set upon a six-mile peninsula bordered on one side by Boston Harbor and on the other by the Atlantic Ocean." Once the home of a large amusement park with a famous roller coaster, it had developed haphazardly, with recreation rather than posterity in mind. Big houses sat cheek and jowl with tiny ones, shoehorned together on tiny streets. Some of them were beautiful and some of them were decidedly not. Six Mile Beach was a working-class town, a town with a twenty-four-hour Laundromat and a very busy police force. For we had moved from a town with no crime to a town in which the police log in the weekly local paper was a hotbed of information. On big weeks - Six Mile had recently seen a large cocaine bust and a small wave of heroin-related deaths - the log ran three pages, but even on a normal week it ran two. Some women might not want to move to such a place with a young daughter, but not only does she like it, she is not a bit condescending. She never felt at home in Hearts Are Cold, but both she and her daughter are decidedly happy in Six Mile. 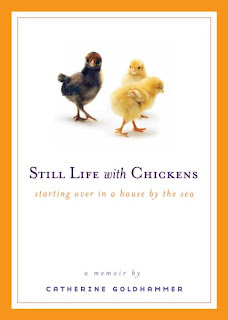 The six chickens she gets are, in the beginning a bribe to get her reluctant daughter to be more enthusiastic about moving, but they become an important part of the change that happens in leaving one life for another. In this book we don't get to know the workers as we do in the other, but we do meet her great women friends, the "Moon Women" who get together each month on the full moon and go to the beach with food. This, too, is a wonderful book. Both are journeys of a sort; interior journeys symbolized by the outside work on a house. The Whouley book is subtitled, A Woman Moves a House to Make a Home. The Goldhammer book's subtitle is, starting over in a house by the sea. I loved both books and I highly recommend them. We think we can trace the influx of snakes (common garter snakes) to upheaval caused by Tom building a patio last summer. Ever since, they are everywhere. The other day I saw one in the vegetable garden and thought, "snake in the Garden of Eden." Then I saw one in the grass and thought, "snake in the grass." They are on the terrace steps sunbathing every morning. We hear the rustle in the daylilies. I'm frightened and fascinated at the same time. It is indeed the "sudden" movement that scares me. I love the way she says "zero at the bone" for what we would say "chilled to the bone." Do you suppose that was the expression then, or was this the poet's language? The way she describes the grass moving as if combed is perfect. I take hundreds of photos, discarding most of them. The closeups here were not taken with a zoom. The lens was about 3 inches from the snakes. Mellow fellows. You may (or may not) wish to click on the pictures to see them better. Well, I told Tara that I was going to go out and sit and watch what was around me. Here is where I sat. Onion plants doing well, and are those dog prints I see? The peas are up. The garden fork is my little homage to Beatrix Potter's Peter Rabbit. And indeed, quite often the song sparrow perches on top and sings away. The garlic we planted last fall is looking great! The lilac is just starting to open. What I heard: sparrows and finches and the wind rustling the trees. What I smelled: The lilacs haven't opened enough yet to perfume the air, so the only smell was the bread baking in the kitchen. Now, this wasn't a perfect example of sitting and watching because I did bring the camera, but still... The photos aren't so great because I was looking right into the sun. Those chairs face south. And my dogs didn't join me because they think it is too hot out. At this season of the year, I think often of Thoreau living his solitary life in the hut by Walden Pond. I too, in spring, feel impatient with the busyness of life. Thoreau knew what he was about. "I went to the woods because I wished to live deliberately, to front only the essential facts of life, and see if I could not learn what it had to teach, and not, when I came to die, discover that I had not lived." Sometimes I think we rush so, we finish a schedule only to make a newer and busier one. We do not, ever, live deliberately and fully, for we haven't time. I know few people who go outdoors now and sit quietly for a couple of hours just looking at the miracle of spring. Sometimes as we drive along the country roads, I see occasional figures stretched out in lawn chairs. But they aren't observing May, they are reading the newspaper or a magazine. They are like the people I have seen on the great beach at Nauset on Cape Cod who never hear the music of the tide because they have portable radios playing hot music! I hate to think what Thoreau would have said to that! Perhaps the color of May is pink and violet. The apple blossom buds are pink, and some of our trees bear true pink bloom. The violets cover the ground and invade the lawn so that it is hard not to step on them. One of my New Year's Resolutions was to go out to the movies more. I couldn't bring myself to leave the warm house during the winter, but last evening was a perfect night for a movie. The little town we live in has a three-season theatre, and Tom runs the projector on Wednesdays for the early show. 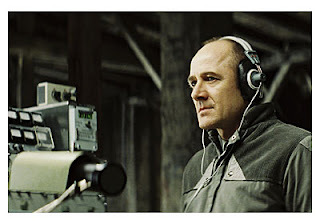 The first film of the season was The Lives Of Others. I love spy stories and this was a great one. The movie begins in 1984 East Germany, before the wall came down, and ends in 1991. The drabness of the streets, the buildings, the interior decoration, the clothes are just amazing. They are like characters in the movie. There is little beauty anywhere. But we see that after the wall comes down, there is truly ugly graffiti on the formerly pristine buildings. Does this have to be a price of freedom? I don't like to know too much about a movie before I see it, and I don't want to spoil the wonder of seeing it fresh for any of you, but I recommend it very highly. The acting is terrific, the story is very interesting, and we learn a lot. I can't ask for more from a film. Just two weeks old, and the chicks are moving out of their cardboard box in the cellar to the barn. On the way, we set them down for a bit to enjoy the sunshine and warm air. Haven't they grown! They'll stay in the pen until they're about as big as the other hens. The pen is covered only with chicken wire so the big hens and the little chicks can get to know each other without being in actual physical contact. We've done this with any new arrival into the farm family, and it has always worked well. It's human nature, or at least a gardener's nature (which is not quite the same thing), to want to live at least one and preferably two climatic zones warmer than where he gardens. Thus, in Washington the gardener wishes he could grow the flora of New Orleans or at least Savannah. Such a gardener is forever trying to find hardy oleanders and Confederate jasmines. In Boston, though, they are not even thinking about oleanders or gardenias, but as someone recently wrote me from there, "What I would give if we were warm enough for evergreen hollies." There are gardeners in the far upper Midwest whose dreams are simply to be able to grow the rambler rose 'American Pillar'. I spent a little time on a paradise island once, where the air was full of butterflies as big as saucers and the trees were hung with glossy vines laden with scarlet waxy flowers. It was there that I woke up one morning with a scorpion sitting on my chest. I had an excellent view of him until he stung, at which time I rose up with greater speed than usual, and this has colored my view of tropical paradises. 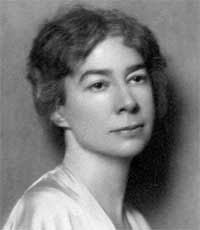 The pain was no greater than that of a wasp sting, but an egg-sized lump swelled immediately over my sternum; it subsided in forty-five minutes, and I had no aftereffects beyond new insights into the folly of envying those in warm climates. As Eudora Welty once wrote in her fiction (a country school-teacher's exhortation to her pupils as a tornado approached), "We're in the best place right here." That could be the wise gardener's motto. Wherever one gardens is the best place right here. First rhubarb of the season! Note: You can use frozen strawberries, and you don't need to defrost them first. Enough rhubarb and strawberries to cover the bottom of an 8-inch square pan, in the proportion of your choice. Sprinkle with 1/3 cup sugar. 1. Preheat the oven to 350-375°F. 2. Combine the rhubarb and strawberries in a greased 8-inch square baking pan. Sprinkle with the sugar. 3. Mix together the topping ingredients in a medium-sized bowl. Distribute the mixture over the top of the fruit, and pat it firmly in place. 4. Bake uncovered for 35 to 40 minutes, or until the top is crisp and lightly browned and the fruit is bubbling around the edges. 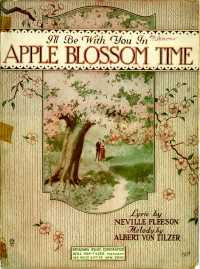 I'll be with you in apple blossom time. "Happy the bride that the sun shines on today." What a wonderful wedding there will be. What a wonderful day for you and me. As I looked at my Amazon account this morning, I saw that I placed my first order there in 1997, ten years ago! Is that possible? These were the days when they included free bookmarks with your order. I still have four from that time, and I cherish them. My first order contained Bob Greene's, Be True To Your School. I still own it, and haven't read it... yet. :<) Then I bought a couple of the Niall Williams/Christine Breen books about moving to Ireland. They are still on the shelves, and while I've read the first two (and don't own them), I don't believe I ever got around to these two. It's time I do so. I see a few of the Mitford books, and some books about raising teenagers. That's where I was in my life just then. I see some Hardy Boys books I bought for my then, twelve year old son. There are a couple Oprah books, really the only ones I read. I remember thinking it was just the coolest thing that all these people were reading books together, though I never watched (and still don't) the show. Then I found that the themes weren't really my favorite reading, and I stopped. But those books, that book club introduced me to a bunch of women I am still friends with today, through a smallerthanamazon online bookstore called books.com. When I began this post, I thought it would be fun just to show those great old bookmarks. Then as I checked back over the account, I saw my life in the past ten years through books and music and movies and cookbooks and calendars. Much more emotional and moving than I expected on this Saturday morning.